Due to concerns officials at Jones Bothers Park have with facility saturation and ramp availability at current levels, we will not be able to use Jones Brothers as the host location. As a result, we have secured Pace Bend Park (Tournament Point) as the host facility. Please keep in mind you may launch at any alternate location on Travis the morning of, and motor over to Tournament Point for the usual numbered boat release. Pace Bend has a $15 launch fee, anglers over 62 are free, if you have a current Travis County Parks Annual Vehicle and Trailer Pass then your entry is free as well. Pace Bend only accepts cash or check as payment. Thank you for your flexibility and for fishing TTZ! There is a link on the Lake Travis event page for early online registration. Friday, January 11th — 5:00pm to 8:00pm at Pace Bend Park in Jonestown. -At early registration we will provide complimentary food and beverages. If you have questions please contact us anytime, Brian Booker, (512) 761-2426. 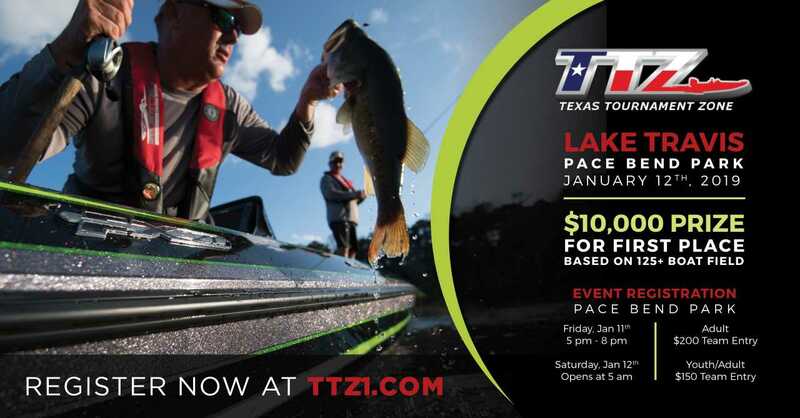 TTZ events are sanctioned for Skeeter Real Money, Triton Gold, Legend Advantage, BassCat Quest, and Phoenix First Flight. Enter 4 of 8 events across either division to qualify for the Championship. It's almost time, looking forward to a great weekend of tournament fishing! Pace Bend or Arkansas Bend?